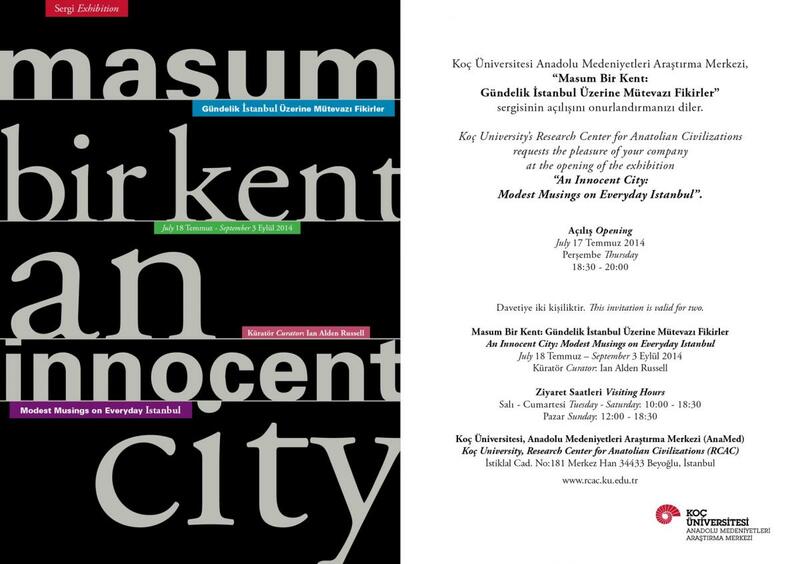 I am happy to announce the opening of “An Innocent City” at the RCAC Gallery on Istiklal Caddesi in Istanbul next Thursday, 17 July 2014, from 1830-2000. An Innocent City is an exhibition of stories and illustrations of the everyday objects of Istanbul. The objects presented here were inspired by objects on display in the cases of the Museum of Innocence in Cihangir. Graduate students from Koç University chose objects from the Museum and searched the streets of Istanbul to find the lives of these objects in the city today. A series of stories, illustrations, and everyday objects on loan from local community members, An Innocent City is a platform for considering the different meanings and shared significance of the everyday objects in our lives. It is our hope that this exhibition will prompt future responses from others wishing to collect and share their stories. We welcome you to enjoy the exhibition, read the stories, and if you would like, share a story of your own. The Museum of Innocence in Cihangir, Istanbul houses a collection of objects collected over two decades by the writer Orhan Pamuk. Pamuk used the objects as inspiration for the creation of the characters, scenes, and stories of his novel The Museum of Innocence (2008). The novel’s narrative revolves around objects, their place in our lives, and how they evoke memories of times past. In the story, the character Kemal collects the objects in an effort to preserve some part of his love for Füsun. In the novel, Kemal asks the author, Orhan Pamuk, to build a museum for these objects – collapsing the boundary between the imagined world of nostalgia in the novel and the real life nostalgia of the collector and curator of the museum. Today, the Museum of Innocence presents a series of over 70 vintage wooden exhibition cabinets – one for each chapter in the novel. The cabinets hold carefully created displays of everyday objects. There is little to no text next on the cabinets, so they, at one time, both illustrate the story of the novel and present ambiguous, nostalgic assemblages from the streets of Istanbul. As collector/curator, Pamuk says that it was, in part, an effort to preserve something of the rapidly changing neighborhoods of Çukurcuma and Cihangir in Beyoğlu, Istanbul. An Innocent City at the RCAC responds to Museum of Innocence by moving away from the intimate space of the museum back into the public life of the city today. Approaching the objects from the Museum of Innocence’s collection as characters, we followed the lives of everyday things to share an alternative perspective on the cultural heritage of the city of Istanbul as it is alive in everyday life today. A tea glass, a coffee cup, a hairpin, each object brings us on unique paths through the city and present unique perspectives on how we live in the city. Recorded in story and illustrated through photography, cartography, and graphic design, the lives of these objects are accompanied by an informal, temporary loan from a member of the local community. The result is a collection of stories of the city of Istanbul as it is today, as seen through the lives of our everyday objects.